Lime Bikes piled high in a Denver scrap yard. Credit: Lime Bike Insider. "These bikes when scrapped are actually a form of electronic waste," said BAN Founder and Director, Jim Puckett. "On the one hand, even the non-motorized bikes contain hazardous lithium-ion batteries and toxic circuit boards. On the other hand, they can be refurbished for children or used for transport in developing countries. If that is not possible, the parts such as GPS units, electric locks, motors, and wheels can be harvested. For both their value and their toxicity, these bikes should not just be treated as garbage or scrap metal." While bikeshare companies can certainly tout their environmental credentials in reducing the carbon footprint in transportation, according to BAN, they have failed as yet to reduce the toxics footprint or embrace the circular economy. The concern becomes more acute as more and more rideshare companies are transitioning to electric powered vehicles with even larger batteries and more hazardous components. As reported earlier this summer, Lime has been exposed for dumping lightly used bikes at scrapyards in Colorado and Arizona. And most recently, Ofo bikes, which have been the subject of stunning pictures of massive bike dumps in China have now been revealed to be creating their own piles of scrap here in the US. 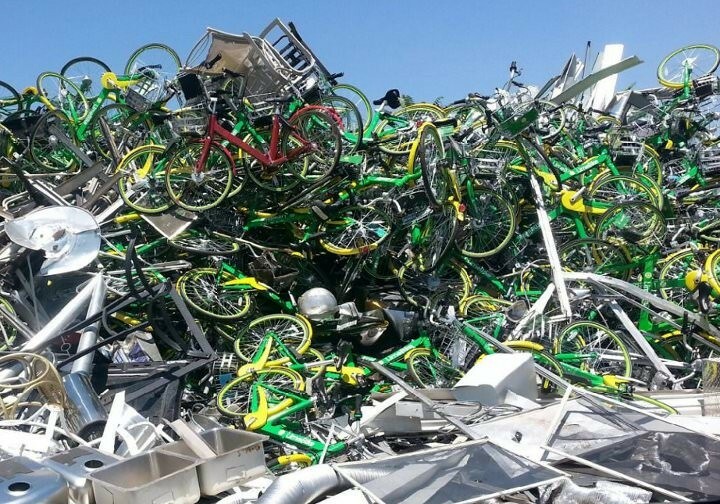 On August 7th, a small mountain of Ofo bikes were found piled in a Dallas, Texas scrapyard. Locals have been alarmed at the blatant waste of valuable bikes and parts. Already some cities are demanding that more be done. "In Kansas City, as an e-Stewards Enterprise City, we are eager to work with shared mobility technology companies to ensure they have socially and environmentally responsible end of service life plans," said Rick Usher, Kansas City Assistant Manager for Small Business and Entrepreneurship of Kansas City. BAN also seeks to help the companies and cities with their recycling policies and introduce them to the e-Stewards Enterprise program which uses e-Stewards Certified Electronics Recyclers who are audited to the highest standard of worker and environmental protection. e-Stewards also will not ship hazardous e-waste overseas and always make a maximal effort to reuse old equipment. e-Stewards Cities include Seattle, Kansas City, San Francisco and San Jose. e-Stewards Enterprise companies include LG, Samsung, Bank of America, Boeing, Raytheon etc. BAN hopes to add the new Rideshare companies to the list. "The question now begged is whether the new rideshare companies truly just care about the environment or are they really all about grabbing customer dollars and data," Puckett said. "We hope they move very quickly to give us the right answer before we discover more bike dumps. We stand ready to help."